One of the hottest mobile games of all time - now finally properly optimized for Windows Phone by the same team that created the original version! See for yourself why Touch Arcade called Doodle Jump “possibly the best [mobile] game ever created” and Macworld called it “a perfect micro-game, insanely addictive, and deliciously replayable.” How high can you jump? Journey up a sheet of graph paper, perpetually jumping from one platform to the next, picking up jet packs, avoiding black holes, and blasting baddies with nose balls along the way. Laugh with delight as you blow past other players' actual score markers scribbled in the margins. And be warned: this game is insanely addictive! Features: -	Many fantastical worlds to play in - Space, Jungle, Soccer, Underwater, Snow, Halloween, Ice, Easter, and now NINJA!! -	Awesome power-ups to pick-up (JET PACKs, PROPELLER HATS, ROCKETS, trampolines...) -	Trippy obstacles to avoid (UFOs, black holes, and many, many monstrous monsters) -	Mad platforms to jump on (Broken, moving, disappearing, shifting, EXPLODING…) -	Global leaderboards, fun achievements! Beat your friends’ scores! 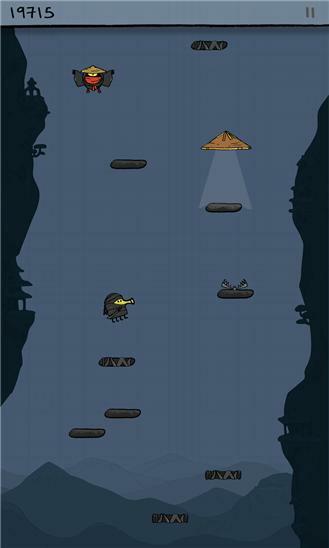 How to play: Tilt to move left or right, tap the screen to shoot. 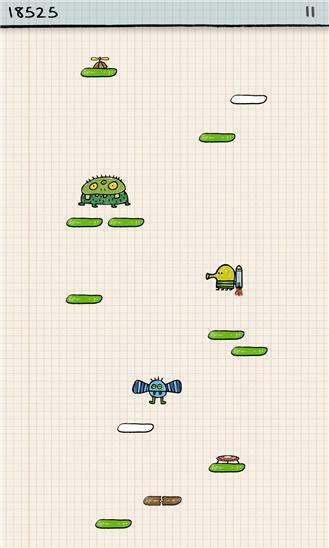 As seen on TV (Big Bang Theory, Parks & Rec, Bad Girls), movies (Battleship), late-night (Jimmy Fallon) and on tour with Lady Gaga, find out why Doodle Jump is a true cultural phenomenon. * BE WARNED: This game is INSANELY addictive! * Don't doodle jump and drive! What's New: - No more screen dimming - New icon just for Windows Phone 8 Improved 8.1 compatibility.